Daniela is a tech and gadget savvy mom who thinks tech isn't just for men and can assemble and dissemble a PC faster than her husband. Great advice, While I would never donate my computer to a school, because then I think it would be more likely to be hacked. What program would you suggest to use to wipe your harddrive. Hey Shane, I recommend using BC Wipe or KillDisk. Good post, Daniela. 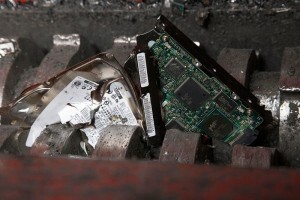 A lot of people forget that their hard drives could be accessed by other people once they throw it away and sensitive data might be recovered from it even though it has been formatted. I read somewhere that passing the drive through a strong electromagnetic field will ensuring total erasure of all data. Is this true? While it is definitely possible to erase a hard drive using a giant magnet or an electrically-charged magnetic coil (this method is also known as “degaussing”), I wouldn’t recommend it. A powerful magnet in the hands of a novice can completely ruin a computer hard drive (not to mention mess up a computer monitor), so I wouldn’t recommend that method unless you know what you’re doing and can afford to trash the drive anyway. There is always the option of format and rebuild – more time consuming, but less wasteful. I never knew that Phil, I think I need to investigate that now! After a quick investigation, it would seem that you are right Phil, a computer expert should be able to recover most if not all the data from a recently formatted hard drive! The thing with this is to remember that when you delete a file your computer only really deletes the link to that file so you can’t see it any more, it’s still there and can be accessed by someone who knows how. These programs write over the drive multiple times until the files are eventually overwritten. Personally, I would just take the hard drive out before donating a PC to anyone. They’re cheap and easy enough to replace anyway. One should always wipe their hard drive whenever they come to sell their computer. If I didn’t for example, it would be just my luck that the person I sell it to is an elite hacker! haha. Great tips and information here, loving it!